The Mind's Elbow: You were a WHAT? Well, at least this is a photo of him at a point in time before we met. But fear not! The guy inside is absolutely, positively just as dreamy and smart as The Professor (Thank YOU, Powers-That-Be!). 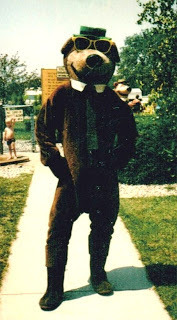 Back in the day, “being the bear” was a good summer gig for a tall teen in Indiana… well, except for the fact that it was about 9000° inside the suit. Oh, and that children, as a collective, always think it’s a GREAT idea to push Yogi into the pool. The point is, everyone has an interesting past. Everyone. That retired principal, for example, was once a champion barrel racer. And see that chaplain over there? She walked the tightrope in a circus. Yes, these are real people I know. As for me, I spent a year testing inmates in Indianapolis, and so my offspring always enjoy the shock value of telling friends that Mom has been to jail. Yep, nuts do not fall far from this family tree. If you’re in the middle of writing a novel, what’s your main character’s interesting past? You never know when this information might come in handy for a future chapter. Now get out there and create about it! Awww...you married Yogi! Does he like pick-a-nick baskets? Sorry--I know that's totally missing the point. Yeah, let's give our characters interesting histories! I agree! Hmmmm... Is it possible that you have an "interesting history" with The Professor?!?! What will you think up next?